In a blender, combine the soy sauce, honey, oil, zest, juice, garlic, ginger, sriracha sauce and salt. Pour ½ c of the marinade into a small bowl and store in the fridge. Add the chicken and remaining marinate into a zip lock bag and refrigerate for at least 6 hours. 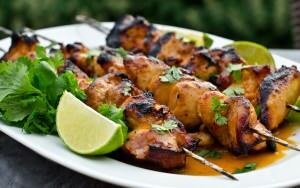 Lightly oil a grill or pan and cook the skewers for 10 to 15 minutes, turning to brown each side. Place the skewers on a serving plate. Warm the ½ c of reserved marinade and pour over the skewers. Serve garnished with cilantro and your choice of sides.